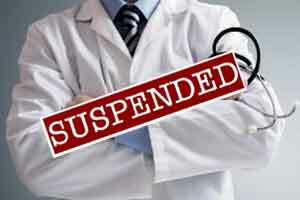 Jammu: Acting tough against absenteeism in the health department, Jammu and Kashmir Minister for Health and Medical Education Bali Bhagat today suspended 23 officials, including three doctors and 20 para-medics, of five urban health centres in the city. Bali, who conducted surprise inspection of the UHCs, Bhagwati Nagar (YatriBhawan), TalabTillo, Lower Roop Nagar, Upper Roop Nagar and Janipur areas, found these doctors and para-medics absent from duties, an official spokesperson said. Taking serious note of the situation, the minister said that slackness, whatsoever, on the part of any official will not be tolerated, and the government shall take stern action against the defaulters. He called upon the heads of institutions to monitor the attendance of all employees and ensure their punctuality and provide better medicare facilities to the patients. Meanwhile, Bali has directed the director health services and CMOs of all the districts to conduct regular inspections of the health institutions to ensure punctuality of staff. The minister also called for strict adherence of dress code in all health institutions and directed for disciplinary action against the defaulters.